As most of you know, last Sunday I was on the road, making what felt like an epic journey to see the total eclipse of the sun. My first reaction to this sign was amusement at its clever play on words. During a total eclipse, the moon, much smaller than the sun, actually locks the sun from sight, leaving only the corona visible, so when we looked up into the sky at the sun during totality, we saw what looked like a black hole in the sky with a corona of light around it to mark the spot where the sun was hidden. The sun literally disappeared for over two minutes, its view blocked by an object much smaller than itself. How often do we let the smaller things in life totally block our ability to see what’s really important? How often we let the little stuff distract us from living in the way that God is calling us, as God’s people, to live, as people who actively seek the Lord and try to discern the will of God, what is good, acceptable and perfect, as Paul says to the Romans in today’s reading. How often do the annoyances and aggravations in life add up and block the light of God’s love in our own lives so that suddenly we find that we are living in a deep twilight that has just somehow crept up on us and overtaken us? What is eclipsing our ability to love one another as God loves us? What, exactly, is blocking us from being able to see the Son? Here are some examples of areas in our lives in which our vision can be blocked before we even realize what is happening. and the relationship dies or just fades away into regret over what once was but now seems to be lost forever. The little stuff can totally eclipse the love in a relationship if we aren’t careful to make sure that doesn’t happen by remembering that God asks us to love one another as God has loved us, even when the going gets rough. Another thing that easily eclipses our view of the Son these days is the current political climate. News cycles and social media keep a whole host of current issues so front and center that these issues jostle in our hearts and minds for first place, usurping even God. The Ten Commandments address this timeless temptation before any other temptation. “You must have no other gods before me,” says God. The idols in our lives can be anything that we put before God and ahead of God in our lives. Our idols can be tangible, like cars, or food, or another person, or our pets, or our possessions, or our investments, or our favorite news channel—anything that becomes an addiction. Our idols can be more intangible—the need to be completely self-sufficient, to be in control, the need for order, or the need for chaos, the need to make ourselves worthy through work or accomplishments– ANYTHING can become an idol in our lives if we put that thing, tangible or intangible, before and ahead of God. Right now in this country we are seeing what can happen when our devotion to history becomes an idol that we put ahead of God in our lives. Let’s take the controversial subject what to do with Confederate memorials. Before I go on—don’t be alarmed, or get your backs up! I’m not going to tell you which side is the “Christian” side to take over this issue, because as our bishops put it in a recent communication which you can read for yourselves in the September newsletter which will be coming out soon, this issue about what to do with Confederate statues is a complex one with a number of legitimate points of view. As we all know, some people feel passionately that the statues should come down because for them, the statues represent oppression. Other people feel just as passionately that the statues should remain in place because they represent a proud heritage. What people on both sides of this issue have in common is the temptation to allow history, embodied in statuary, to become an idol that steals God’s rightful place in their lives—to be the thing that moves in front of and eclipses their view of the Son. Am I saying that we shouldn’t care? Of course not! What I’m saying is that we don’t want our passion over this current issue, as well as others, to become idols that separate us from God and from one another. So I’d like to offer you a way to test out whether or not something in your life is becoming an idol. Ask yourself—is what I’m feeling about an issue making me resent or even downright hate the people on the “other” side to the exclusion of recognizing that God also loves the people on the other side of the issue just as much as God loves me? Is what I’m feeling about an issue making me want to engage in violence and with hatred in my heart against others? Am I forgetting that I can still respect the dignity of every human being, even those with whom I disagree? If the answer to any of these questions is yes, then the issue that I feel so passionate about may be becoming an idol that is blocking my view of God. So please, any time you start feeling obsessed about any issue, large or small, personal or communal, take the litmus test, and ask yourself, “Is this particular thing damaging my relationships with others and eclipsing my view of the Son?” If the answer is yes, it’s time to renew your mind and turn back toward God’s love. I’ll give you an example from our own church about how people in this community disagreed with one another, felt divided, and then took the litmus test, engaged in reasoned discussion, and came up with a compromise solution. This issue is one of public record, so I’m not divulging any secrets or betraying any confidences. When we repainted the outside of the church, we stripped all the paint away from the woodwork to eliminate any lead paint. The wooden church doors and the framework around them were stripped of their coats of dark paint. And the entryways, without paint, really appealed to some members of the congregation and Vestry, because the design in the wood was much more apparent, and the decorative touches were more visible. But others felt just as strongly that our two entryways looked awful without paint, because the flaws in the wood were also more visible. And so we were divided, actually sort of passionately divided. And believe me, smaller issues than whether or not to repaint the church doors has split countless numbers of churches apart. To the credit of those serving on the Vestry, no one wanted the church doors to become the idols that were so important in our minds that what we did with them would affect our relationships with one another negatively. So we took the litmus test when Elizabeth Heimbach said in one Vestry meeting that our feelings about how to treat the doors should not become more important to us than our love for one another. In an attempt to renew our minds, we engaged in reasoned discussion, sought an expert opinion, and surveyed others in the congregation. And guess what, at the end of the day, we still had a complex issue on our hands with no clear right solution. So we compromised. We decided to paint the framework around the doors, and to leave the doors unpainted and to varnish them instead with clear varnish. I doubt that anyone on the Vestry was completely happy with this compromise, since neither side got exactly what it most passionately desired. However, our love and our respect for one another remained intact, and our view of the Son was not shut out by our disagreement over the church doors, and as Helmut likes to say, there was once again peace in the valley. In today’s gospel, Jesus and the disciples are in Caesarea Philippi. This place, at the headwaters of the Jordan River, is a Roman spa and vacation center. The Roman gods are on display everywhere. Even today, in the ruins of this once opulent city, the niches carved into the mountainside for the statues of Pan and other Roman gods are still visible. In this setting, Jesus asks the disciples, “Who do people say that I, the Human One, am?” And the disciples list off people from their own Jewish culture that their own people tend to idolize—maybe Jesus is John the Baptist, Elijah, Jeremiah, or one of the prophets. At this moment, nothing is eclipsing Peter’s view of the Son. He sees clearly who Jesus is, and states it for all to hear. We are all Peter. Every time we look at Jesus and say yes, Jesus, you are the Messiah, the Savior, the Son of the Living God, Jesus puts the keys of the kingdom of heaven into our hands. The sacrificial life, death and resurrection of Jesus is the doorway through which we can enter into this very kingdom of heaven, right now, even as we wait for God’s salvation and deliverance to be completely realized when time is completed at the end of time. And with the keys to the kingdom in hand, what we hopefully will bind on earth as it is in heaven is love—God’s love. The writer of Colossians reminds us, that as God’s chosen ones, holy and loved, we are the ones in this world who have the privilege to put on compassion, kindness, humility, gentleness and patience. We are the ones who get to be tolerant with each other and, if someone has a complaint against anyone, to forgive each other as the Lord forgives us. And over all these things we get to put on love, which is the perfect bond of unity. The peace of Christ must control our hearts—a peace into which we were called in one body. And we are to be thankful people. The idols of this world will pass away. But God’s love never ends and the Son will always shine with everlasting light. As the prophet of Isaiah said, even now, in the waste places of our lives, new life springs forth. The Lord will comfort us and will make the wildernesses in which we wonder like the safety and richness of Eden itself. The dry places in our lives will become a garden of the Lord, and joy and gladness will be found there, thanksgiving and the voice of song. God, renew our minds, and restore to us the joy of your salvation. 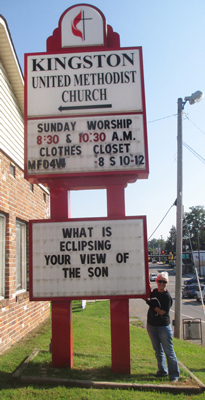 And help us to let nothing eclipse our view of your Son.